Isaac’s second grade class was given an assignment. They were told to write a short essay about their favorite place to go. They made a list of places they like, chose one, and started in. Isaac chose his imagination. The teacher told us about this in a parent-teacher conference, and she was obviously delighted with his answer and of course I loved her for that. And of course I love Isaac’s answer. I can’t visit his imagination with him, but he’s drawn me pictures and told me stories–he’s sent me postcards. There’s never a dull moment. It’s an exciting place, a destination. Later on at Malcolm’s conference they told us what a good job he’s doing with the focussing and the paying attention and the being prepared. And then they said, but sometimes he’ll just be…gone…for a few minutes. Just staring into space, and he’ll look so happy and content. And I said, “Oh yes, didn’t you know? He can travel through time and space. He can close his eyes and be in a different world. Yeah, he told me all about it just the other day.” Heh heh! Of course I didn’t say that!! I didn’t want them to think I’m crazy! What’s cute and clever in a seven-year-old is cause for alarm in older children and their parents. But I’m proud of Malcolm’s world-to-world traveling abilities, and I’m so glad and grateful that both boys have this prodigious talent. I consider it a very solid and serious real-world skill. Just think what it means! They’ll never be bored! They’ll never be stuck in a dull place with nothing to do! It costs nothing, they can’t lose it but they can share it, and nobody can ever take it away from them. I thought this was a very delicious meal. It made me happy to make it and to eat it. It’s a pizza piled high with deliciousness. Sweet potatoes are diced quite fine and roasted with shallots and balsamic vinegar. 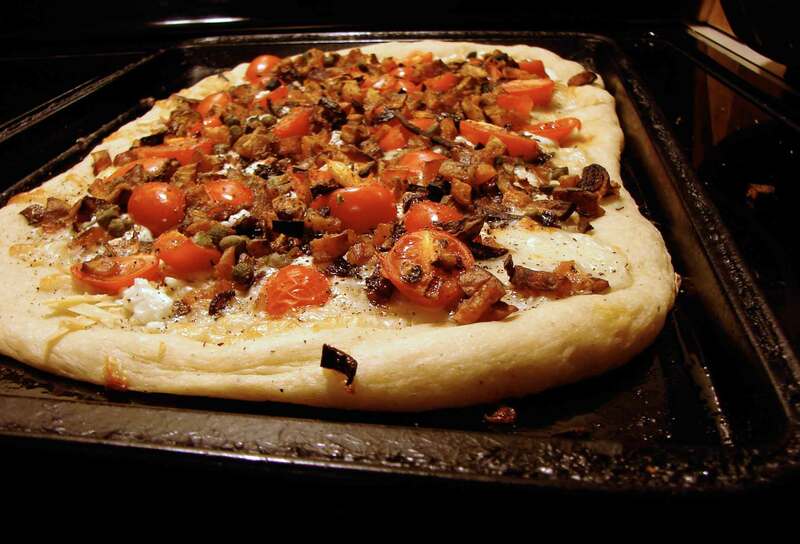 They’re piled atop goat cheese and mozzarella and smoked gouda, and on top of that we have tomatoes and capers. Fresh and sweet and smoky and satisfying. Very autumnal. Here’s Places and Spaces by Donald Byrd. Preheat the oven to 425. Toss the potatoes and shallots with the olive oil and balsamic. Spread them in a single layer on a baking tray and roast until browned and crispy. About 20 minutes. Watch closely that they don’t burn. Set aside. Remove from the oven. Mush the roasted garlic clove and spread one over each pizza. Sprinkle the cheeses over that to form an even distribution. Spread the potatoes and shallots evenly over the cheese, and the tomatoes and capers over the potatoes. Sprinkle herbs over everything. 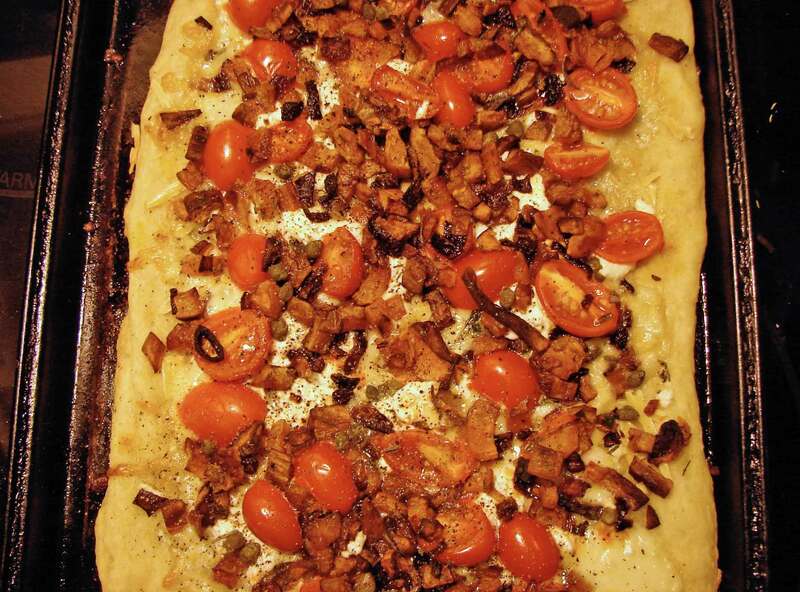 This entry was posted in crust, recipe and tagged crispy pizza crust, pizza, roasted shallots, sweet potato pizza by Claire. Bookmark the permalink.